Download "Regulations for the Degree of Doctorate in Clinical Psychology (ClinPsyD)"
2 (4) Satisfactorily present the results of research, study and training in a research thesis and pass such academic and clinical assessments as may be required by the Head of School (or nominee). 2.3 A candidate who is a full-time employee of the National Health Service or other agencies shall not undertake additional paid duties in or outside the University without the express permission of their employer. 3 DURATION OF COURSE 3.1 The period of study and registration shall, subject to the following exceptions, be three years: (1) The candidate may, with the permission of the appropriate Head of School (or nominee), spend no more than twelve months of the period of study at some other approved place of study or research. When the nature of the research requires that work should be undertaken elsewhere than in the University the Head of School (or nominee) may appoint an additional supervisor. (2) Permission to extend the normal period of study and registration by up to twelve months may be granted by the Head of School (or nominee) on the recommendation of the candidate s adviser. (3) The Head of School (or nominee) may permit the interruption of the period of study and registration if there are special reasons for doing so. 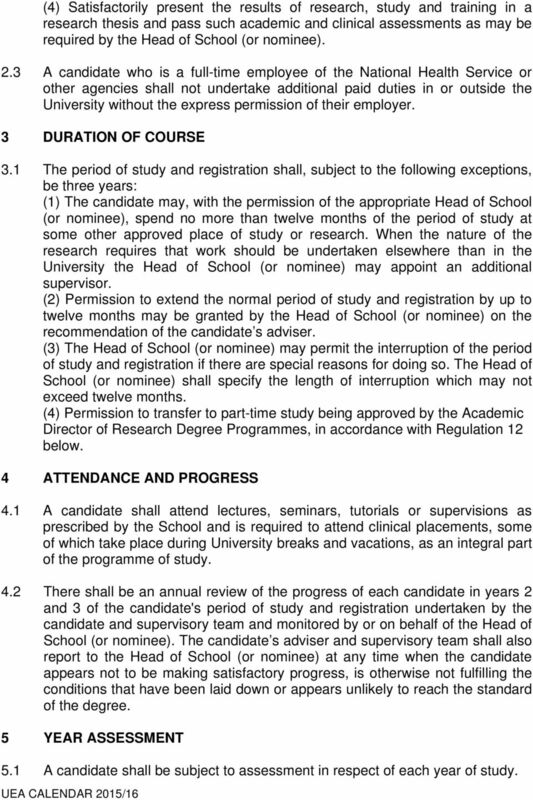 The Head of School (or nominee) shall specify the length of interruption which may not exceed twelve months. (4) Permission to transfer to part-time study being approved by the Academic Director of Research Degree Programmes, in accordance with Regulation 12 below. 4 ATTENDANCE AND PROGRESS 4.1 A candidate shall attend lectures, seminars, tutorials or supervisions as prescribed by the School and is required to attend clinical placements, some of which take place during University breaks and vacations, as an integral part of the programme of study. 4.2 There shall be an annual review of the progress of each candidate in years 2 and 3 of the candidate's period of study and registration undertaken by the candidate and supervisory team and monitored by or on behalf of the Head of School (or nominee). The candidate s adviser and supervisory team shall also report to the Head of School (or nominee) at any time when the candidate appears not to be making satisfactory progress, is otherwise not fulfilling the conditions that have been laid down or appears unlikely to reach the standard of the degree. 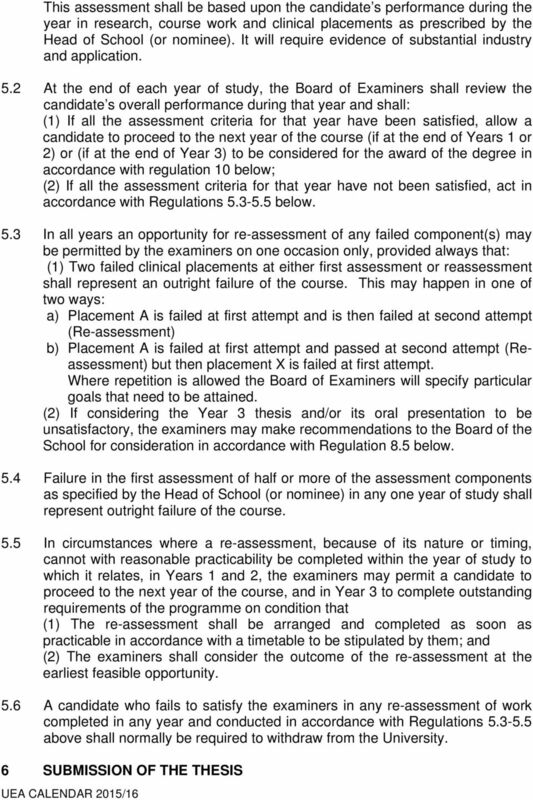 5 YEAR ASSESSMENT 5.1 A candidate shall be subject to assessment in respect of each year of study. 4 6.1 The final assessment shall include a research thesis of up to 40,000 words, which shall be a report of original investigations and should represent a significant contribution to the development of understanding in the field of Clinical Psychology and an oral examination on the thesis. For candidates matriculating after September 2014: 6.2 The research thesis will consist of a portfolio of written material, comprising a systematic review and an empirical data study and additional bridging chapter(s) detailing additional methodology and results, with a final discussion and reflective chapter. 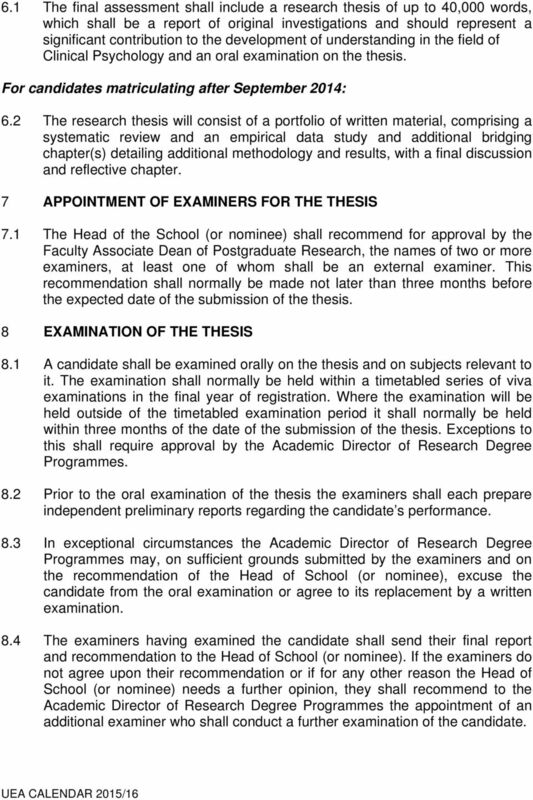 7 APPOINTMENT OF EXAMINERS FOR THE THESIS 7.1 The Head of the School (or nominee) shall recommend for approval by the Faculty Associate Dean of Postgraduate Research, the names of two or more examiners, at least one of whom shall be an external examiner. This recommendation shall normally be made not later than three months before the expected date of the submission of the thesis. 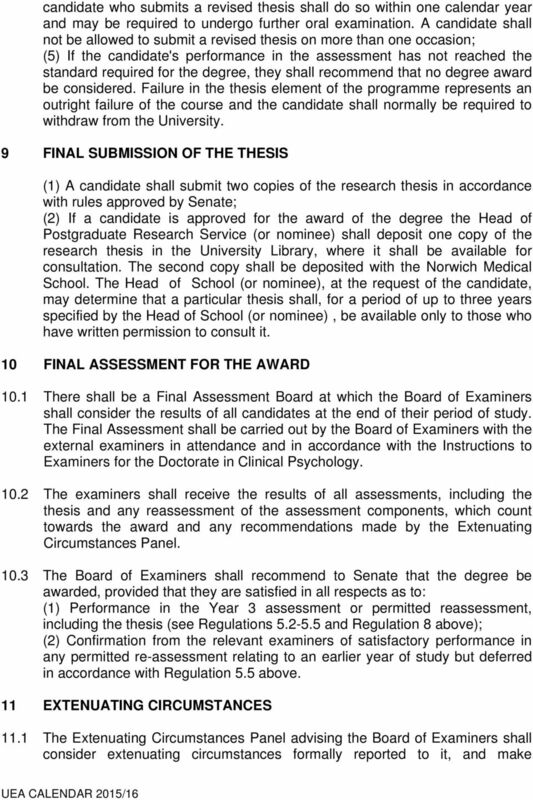 8 EXAMINATION OF THE THESIS 8.1 A candidate shall be examined orally on the thesis and on subjects relevant to it. The examination shall normally be held within a timetabled series of viva examinations in the final year of registration. Where the examination will be held outside of the timetabled examination period it shall normally be held within three months of the date of the submission of the thesis. Exceptions to this shall require approval by the Academic Director of Research Degree Programmes. 8.2 Prior to the oral examination of the thesis the examiners shall each prepare independent preliminary reports regarding the candidate s performance. 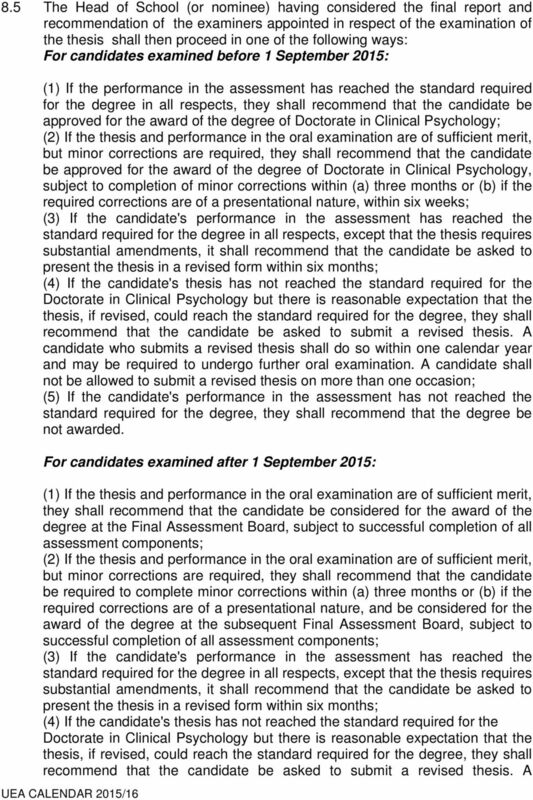 8.3 In exceptional circumstances the Academic Director of Research Degree Programmes may, on sufficient grounds submitted by the examiners and on the recommendation of the Head of School (or nominee), excuse the candidate from the oral examination or agree to its replacement by a written examination. 8.4 The examiners having examined the candidate shall send their final report and recommendation to the Head of School (or nominee). 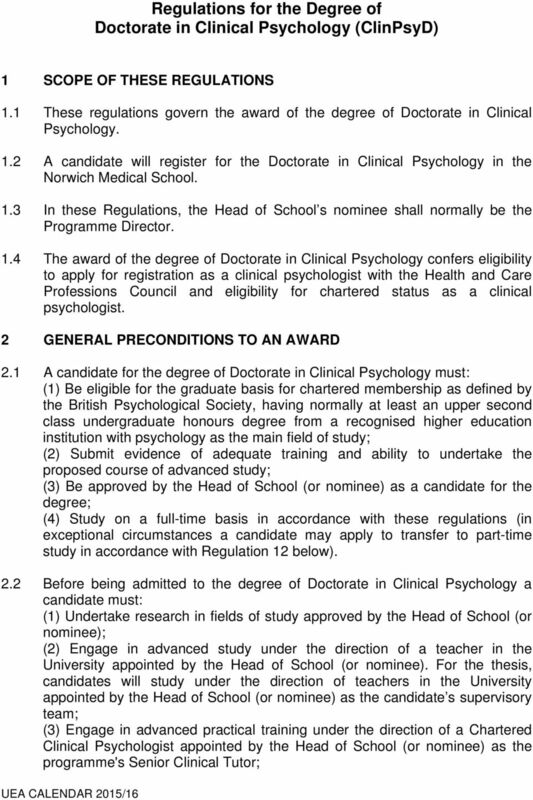 If the examiners do not agree upon their recommendation or if for any other reason the Head of School (or nominee) needs a further opinion, they shall recommend to the Academic Director of Research Degree Programmes the appointment of an additional examiner who shall conduct a further examination of the candidate. 7 recommendations to the Board, in accordance with the University s Extenuating Circumstances Regulations: The Board of Examiners shall formally approve the compensation/remedy/assessment or other recommendation made by the Extenuating Circumstances Panel. Any alternative arrangement shall only be approved by the Board if it is in the candidate s best interest The Extenuating Circumstances Panel advising the Board shall treat all statements of extenuating circumstances as confidential, not to be disclosed outside the meeting of the Panel. Where circumstances are particularly sensitive, candidates may ask that the disclosure of the information be limited. 12 PART-TIME STUDY Candidates will be recruited to the programme on a full-time basis but may by concession be able to transfer to part-time study on a temporary or permanent basis. Transfer to part-time study will require the prior approval of the Academic Director of Research Degree Programmes.